This whole Duck Dynasty drama is a perfect example of the contradictions and limits of conventional American conservative thought. Phil Robertson (Mr. Duck) was fired from his job for expressing his personal views outside his workplace. Although I disagree wholeheartedly with what he said, I actually agree with conservatives who say he should not have been fired. I believe no one should lose the ability to support themselves based on expression of beliefs. However, the First Amendment does not work that way. This is the free market that conservatives tout as being the ideal. Without specific safeguards spelled out in a collective bargaining agreement, the American worker can be fired at will. However, the same conservatives railing against Mr. Duck’s employer tend to be against labor unions, which are the only real protection a worker has under current labor law. Would these conservatives be wiling to give up at-will employment and allow the State to extend First Amendment protection to privately- run workplaces? 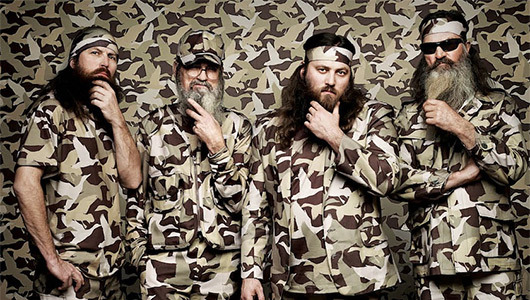 One component of this #DuckDynasty debate I can live without is liberals’ bashing of country folks. Which is understandable; it’s daunting. Just stay out of the way then. I don’t think this is an example of what conservatives believe about free enterprise. This is pure politics and PR crisis management. The real hypocrisy is A&E “firing” Phil but going on to air a new season of the show in which he will appear. We will see what happens as the dust begins to settle. You may be right about A & E’s hypocrisy, but that doesn’t negate my argument. I’m not really concerned with hypocrisy; I pointed out contradictions to show holes in conservative framework. The conservative agenda appears much deeper. There is a concerted effort to rebrand progressive issues as supporting conservatives. The civil rights movement is consistently invoked, emphasizing that it was actually a fight against government regulation designed to free the middle class entrepreneur (see Clarence Thomas, as the ultimate example). Similarly, the right to practice one’s religion is transformed into a narrative of a war on Christianity. I see the same rebranding at work here. Freedom of Speech is transformed into the right of conservatives to say stupid things without consequence, decrying liberals who complain about racist/sexist/homophobic speech as being hypocritical. This is always accompanied by a faux apology. This allows the conservative to send a message to the true believer, while at the same time cloaking their hate speech in a “free speech” narrative. This is a long game, and needs to be countered. Thank you for noting the hypocrisy of demanding workplace protections while opposing unions. This entry was posted on December 19, 2013 by Kenzo Shibata in Politics, Uncategorized and tagged At Will Employment, Duck Dynasty, Phil Robertson.